A framework agreement on Iran’s nuclear program has been reached after marathon talks with six major powers in Switzerland. Under the deal, Iran will reduce its uranium enrichment capacity in exchange for phased sanctions relief. President Barack Obama said a “historic understanding” had been reached with Iran. The world powers and Iran now aim to draft a comprehensive nuclear accord by June 30. The framework agreement was announced by the European Union and Iran after 8 days of negotiations in Lausanne. 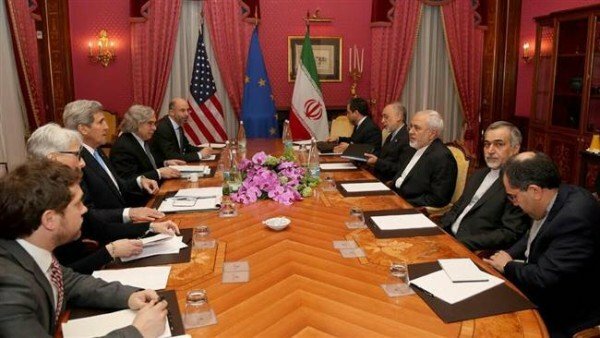 The talks between the so-called P5+1 – the US, UK, France, China and Russia plus Germany – and Iran at Lausanne’s Beau-Rivage Palace hotel continued beyond the original self-imposed deadline of March 31. Iran denies Western claims it is trying to build a nuclear weapon. It entered negotiations in order to see sanctions lifted. US and EU sanctions related to Iran’s nuclear program will be lifted in phases, but can be brought back if Iran does not meet its obligations. Barack Obama said the deal’s implementation would be closely watched. “If Iran cheats, the world will know it,” the president said, adding that the deal was based not on trust but on “unprecedented verification”. He said the framework agreement had come after “months of tough, principled diplomacy”, and that it was “a good deal”. EU foreign policy chief Federica Mogherini, speaking at a news conference alongside Iranian Foreign Minister Javad Zarif after agreement was reached, said a “decisive step” had been achieved. “We have reached solutions on key parameters of a joint comprehensive plan of action,” she said. Negotiators would now start “drafting the text” of the plan “guided by the solutions”, Federica Mogherini added. News that a deal had been agreed emerged on Twitter, before the official news conference.